If you’re planning a rustic wedding then a splash of burlap or hessian has to be top of your list. Numerous brides have fallen for the rawness of its frayed edges and earthy feel. As an added bonus its sustainable and biodegradable, so perfect for the eco-conscious bride too. And even more importantly …. it doesn’t cost the earth! Set the tone of the event up front with a simple romantic design printed on eco friendly Kraft card stocks like ‘Clarabella’ shown here in a dark grey ink. This was printed on 300gsm card stock which keeps costs low for the budget conscious unlike the heavier 4 to 600gsm stocks. 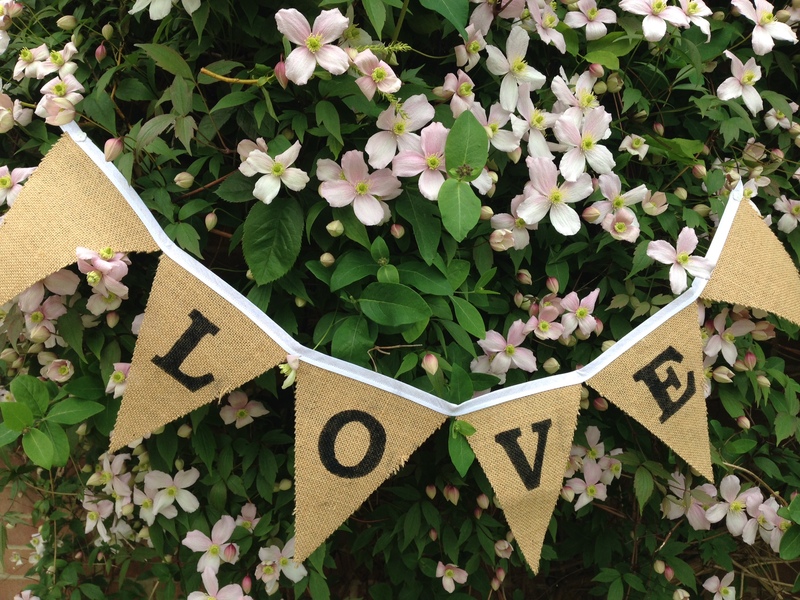 Banners can be used to spruce up your wedding reception and you can still use it over the fireplace or draped amongst the trees in the summer when you have a barbecue or birthday party. This is also a simple way to DIY some of your own wedding decorations – don’t be afraid to ask for help! The wedding table is the main setting for a splash of burlap. Table runners give the main top table a focal point and afterwards you can reuse it on the dining table at home. Wrap small pieces of burlap around your floral centerpieces for instant charm and style with simple white porcelain and a white table-cloth.